Your “Cyber Angel” Ritual Monsters cannot be destroyed by battle. When you take damage by battle or an opponent’s card effect: You can Tribute 1 “Cyber Angel” Ritual Monster from your hand or field; Special Summon 1 “Cyber Angel” Ritual Monster from your hand. (This is treated as a Ritual Summon.) You can only use this effect of “Incarnated Machine Angel” once per turn. Incarnated Machine Angel isn’t here yet, but when it gets here it will lend more support to the Cyber Angel archetype. Searchable by yesterday’s Cyber Egg Angel, IMA protects your Cyber Angels from battle destruction. As some have smaller ATK, this is a good deal of protection, one less thing to worry about, as many players would rather take battle damage than lose cards. IMA’s second effect is like a True King’s Return for Ritual Monsters. Get a Ritual Summon on your opponents turn sets you up for next turn and could help avoiding things like Warning or Strike that would be set in your opponents Main Phase 2. Vrash can wipe the board of any Extra Deck Special Summon your opponent made, all-but erasing progress they have made, Dakini and Izana will send a card to the grave (not destroy, could come in handy) depending on who you use (Dakini for monster, Izana for spell/trap), and Idaten can get you back a card. Those are just the Cyber Angels that gain effect(s) upon being Ritual Summoned. 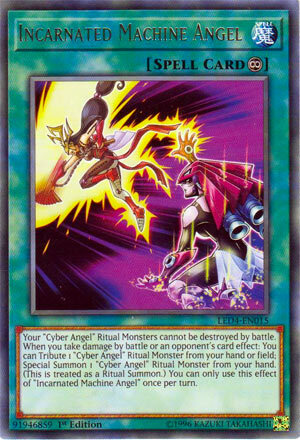 A way to Ritual Summon on your opponents turn is what any Ritual-based strategy could use and now Cyber Angels have it. A good searchable Spell Card. Incarnated Machine Angel is a Continuous Spell Card with no cost, but can only really be used once per turn. Firstly, all your Cyber Angel Ritual Monsters cannot be destroyed by battle. That’s great because some of them are weak but still require an investment of resources. The once per turn effect is to tribute a Cyber Angel Ritual Monster to Special Summon a Cyber Angel Ritual Monster from your hand after taking battle or effect damage from the opponent. The new Ritual Monster is considered to be Ritual Summoned regardless of the levels of the tributed Ritual Monster. IMA introduces a great concept to the deck. Playing during your opponent’s turn dodges many effects and creates interruptions that wouldn’t be available until your next turn. Finally, having a Continuous “Ritual” Spell Card helps to save resources that Ritual decks can have a problem with. I would have loved to see a small Atk boost, but otherwise Incarnated Machine Angel is definitely worth running in the deck. Next up in our Cyber Angel week is one of the new Machine Angel Spells that are searchable with yesterday’s card, and that new Spell is Incarnated Machine Angel. Incarnated Machine Angel is a Continuous Spell with a few effects. First off, your Cyber Angels are protected from being destroyed in battle, which is probably best if you summon Benten or Idaten since 1800 and 1600 ATK isn’t the greatest unless you tributed Idaten for a Ritual Summon. The battle protection is useful though since if you take damage from battle or via an opponent’s card effect, you can tribute a Cyber Angel Ritual Monster in your hand or field to Special Summon any Cyber Angel Ritual from your hand and it is treated as a Ritual Summon. Cute way to Ritual Summon something like Dakini, Vrash, or Izana (the newest Ritual) without the proper levels and it is treated as a Ritual Summon for some fun effects on some Cyber Angel Rituals while tributing others will get other effects. This effect of Incarnated Machine Angel is a hard once per turn, probably to balance it out with not too many Ritual Summons without the Ritual Spell and proper levels. Sure you got to take damage, but taking damage should be common if your opponent wants to win, and it can offer a surprise to your opponent if they deal damage to you with a ton of monsters they Special Summoned from the Extra Deck and you can use this to summon Vrash to destroy them all. Incarnated is a cute card to play in the Cyber Angel deck and it is worth experimenting with a copy or two since it is searchable and its searcher is easily searchable. Art: 4/5 Nice to see Benten and Idaten work together, symbolic of you tributing one for the other’s summon. Incarnated Machine Angel is a Continuous Magic card, and in this review, I’m going to take some time comparing this to another Ritual Support card…this time, being Ritual Cage. Ritual Cage is also a Continuous Magic, and one that prevents you from taking any Battle Damage from Battles your Ritual Monsters participate in. It also protects and keeps theme from being destroyed by Monster or Card effects. This card works is sort of an opposite way, where as your Ritual Monsters are protected from Battle, but you aren’t from taking Damage. But, additionally, if you take Damage via Battle or an opponent’s card effect, you can Tribute a Machine Angel Ritual Monster you control on the Field, or from your Hand, to bring out a new one from your Hand. It doesn’t even state it can’t be the same as the one you choose to rid yourself of. Trading in, in this manner, is usually a good thing. Best case scenario you’re trading something weak you see you’re about to have destroyed and bring out something more powerful. I’m a little weary of how dependent this is on what’s on your Hand. Obviously the Continuous aspect is good in this instance, as you can (in theory) wait until you can make that big play. But this card will be just sitting around sometimes. Art: 3.5/5 One sacrifices for the other, nice use of color in the blast and the background.